Text and Photos ©2011 by J. Pint unless otherwise indicated. 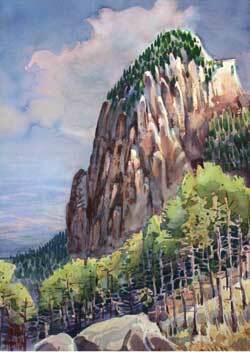 Tequila Volcano's Plug (tetilla) in a watercolor by Jorge Monroy. 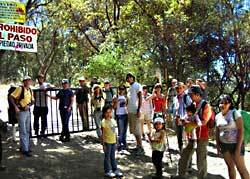 Hikers congregate at the new locked gate beneath signs forbidding access to the upper part of famed Tequila Volcano. The beautiful trail which crosses the crater. 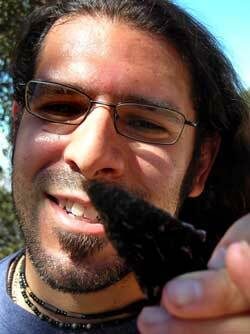 Guadalajara Archeologist Bruno Calgaro examines an obsidian arrowhead he found on the pothole-filled cobblestone road up Tequila Volcano. 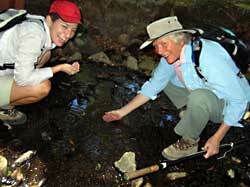 Prisca Esponda (left) of Guadalajara and Susan Street of Zapopan taste the cool clear water of a spring on Tequila Volcano at 2790 meters above sea level. 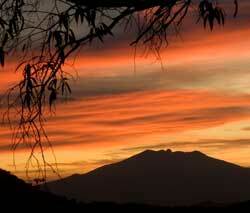 The silhouette of Tequila Volcano, one of Jalisco's most famous landmarks. By pure chance I bumped into Primavera Forest consultant Barbara Dye that very same day and mentioned Brownell’s surprising email. I asked her if they—like the Brownells—had risked criminal prosecution to enjoy the splendors of the crater. A machine gun? This sounded sinister indeed. I decided to call the telephone number prominently displayed on one of the menacing signs. 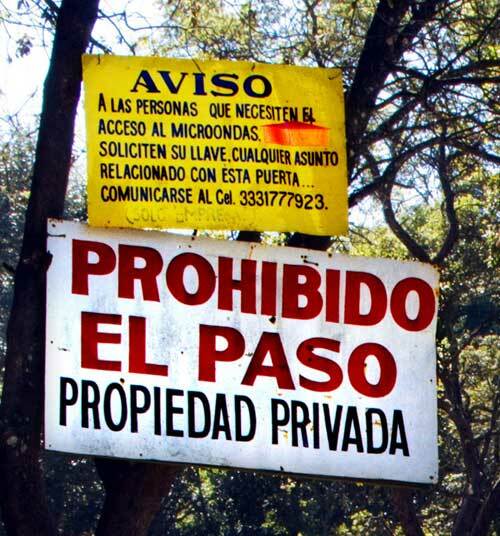 Well, in my book, only a movie subtitle writer could possibly translate “Prohibido el Paso” into “Welcome, hikers” so I decided to find out what the Tequila authorities had to say about the whole thing. “That is absolutely false,” replied the person on the phone. Lic. Rodriguez informed me that it is completely legal to walk up to the crater and that the Brownells are not criminals (You can stop holding your breath, David). She also stated that she would appreciate receiving emails (to meztli.7@hotmail.Qcom --remove the Q please) on this subject. I consulted with Mexican hikers I know and they felt the locked gate is, in itself, a good thing because “troublemakers rarely walk more than 10 meters from their cars.” However, we agreed that the signs need changing, the cobblestone road should be repaired and a parking area must be constructed in front of the gate (where there is presently barely enough room for a car to turn around). To bring about such changes, Lic. Rodriguez needs lots of messages (in any language), so please send her an email, if you want to help. We took the right-hand fork, but after only 100 meters Mario insisted we had to taste “the most delicious water in all Jalisco” which flows from a little spring just below the road. Now this spring is at 2790 elevation which led to a lively discussion on just how the water rises to such a height. Three hundred and fifty meters above the fork you’ll find a delightful trail that takes you inside the crater, past glowing bunch grass, wild flowers and gnarled dwarf oaks covered with thick cushions of moss and lichen. The path goes directly to the base of the huge plug or tetilla rising straight up out of the crater to a height of nearly 3000 meters. Just hiking through the wooded crater is a wonderful experience which could be topped (literally) by a climb to the very peak of the tetilla, where you can gaze upon countless acres of tequila agaves blending together into what look like huge blue-green lakes. Even if you are not a rock climber, a visit to the crater is truly a unique experience and Tequila Volcano is a treasure well worth preserving. So I hope you’ll encourage the Tequila tourist department to start managing it intelligently. From Guadalajara, follow highway 15 west (toward Nogales and Tepic). There is now so much congestion in downtown Tequila that I suggest you take the fast and easy toll road (cuota) which gets you to near the volcano without going through el centro. Just get off at the Tequila exit. As you approach the town, watch out for the railroad track. Immediately after you cross it, take the first left and head west towards Hidalgo Street which is 963 meters away. On reaching Hidalgo, turn left (south). Hidalgo turns into the infamous cobblestone road at N20 52.334 W103 50.557. 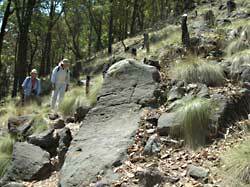 The trailhead for the crater hike is at N20 47.370 W103 50.892. Driving time from the Guadalajara Periférico to the locked gate (via the toll road) might range from 45 to 90 minutes, depending on how many baches (potholes) you have to negotiate.